Dr. Ir. A.B.M. 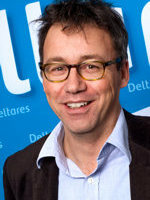 Jeuken is an expert advisor in the field of climate change adaptation and water management. He has a master degree in environmental sciences from the Wageningen University and finished a PhD in Global Climate modeling at KNMI and the University of Eindhoven. After a short career in climate science he moved to work for Rijkswaterstaat, the national authority for water management in the Netherlands, holding several positions at the specialist advisory department for inland waters, RIZA. At Deltares he is combining his knowledge and experience in water management with knowledge on climate change and general methods and concepts on dealing with future uncertainty. Leading the thematic Deltares program on Climate Water and Spatial planning and the Knowledge for Climate program on a climate proof Fresh water supply he plays a central role in connecting science to the practice of policy making in these fields. Throughout the year he has managed several multi-partner, multi-discipline projects. He likes the challenge to combine the knowledge from different disciplines, themes; sectors etc. and integrate it into useful advice for stakeholders. Since the start he is steadily involved in the Dutch Delta program and he can be regarded as an expert on the approaches followed within this program to develop and assess adaptive water management strategies (Adaptive Delta Management). 2008 - present Deltares Expert advisor Climate adaptation. 2007 - 2008 Rijkswaterstaat (RIZA) Head (a.i) department of Estuaries. 2003 - 2006 Rijkswaterstaat (RIZA) Group leader Water quality and morphology. 2000 - 2003 Rijkswaterstaat (RIZA) Program leader Water quality monitoring. 1994 - 2000 KNMI (Meteorological Institute) Researcher Climate modeling. Deltares is leading the integration work package. Climate change training for BMKG. Leading the Deltares work with partners (consultants, other knowledge institues) for this program which includes, several modeling on hydraulics, salinisation, dike stability, ecology, cost-benefit analysis of various adaptation strategies, advice and presentation on policy consequences. Organizing post academic (PAO-TU Delft) course on climate change and water management. Leading national climate project together with Rijkswaterstaat “Climate-proofing the Netherlands” in which the vulnerability of current water management strategy against climate change is assessed and adaptation strategies are designed for the Dutch government . Leading the development of a decision support system for measures to improve the water quality in order to meet goals set by the European water framework directive. The consortium consisted of many parties, containing developers, potential users (water boards) and consultants. Internation Rhine Committee – Estimation of heat discharges along the river Rhine. Modelling of anthropogenic and climate induced temperature increase. Screening of ‘Unknown’ substances in Rhine and Meuse using GCMS and LCMS. Syndicate programme on atmospheric chemistry in climate modeling, participation as researcher from KNMI, subject model validation. Jeuken, A. et al. Midterm report, Knowledge for Climate, KfC 58/2012. Jeuken, A., J. Kind and J. Gauderis. Proceedings of flood risk conference, Rotterdam, 2012. Jeuken, A., N. Haasnoot and T. Bucx. Chapter 4 emerging issues. Gersonius, B., F. Nasruddin, R. Ashley, A. Jeuken, A. Pathirana, C. Zevenbergen. Water Research (2012), doi:10.1016/j.watres.2012.03.060. Kwadijk, J.C.J., Haasnoot, M., Mulder, J.P.M., Hoogvliet, M.M.C., Jeuken, A.B.M., van der Krogt, R.A.A., van Oostrom, N.G.C., Schelfhout, H.A., van Velzen, E.H., van Waveren, H. & de Wit, M.J.M. (2010). Using adaptation tipping points to prepare for climate change and sea level rise: a case study in the Netherlands. Wiley Interdisciplinary Reviews: Climate Change, 1, 729-740.10.1002/wcc.64. Mouton, A.M.; Van der Most, H.; Jeuken, A.; Goethals, P.L.M. ; De Pauw, N. Evaluation of river basin restoration options by the application of the Water Framework Directive Explorer in the Zwalm River basin (Flanders, Belgium) River Res. Applic. 25(1): 82-97. Jeuken, A.B.M., P. C. Siegmund, L. C. Heijboer, J. Feichter, L. Bengtsson. J. GEO RES-A, volume 101, January 1996.